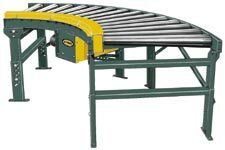 Models 25/26-CRRC & 25 CRRCT are chain driven live roller curve conveyors. They are commonly used in conjunction with the 25/26-CRR conveyor to carry heavy unit loads such as pallets and drums. 25 CRRT is a tapered roller curve, while 25/26 CRRC are straight roller conveyors. 25 CRRC conveyor has straight 2-1/2" diameter x 11 gauge rollers. 26-CRRC conveyor has straight 2-5/8" diameter x 7 gauge rollers. 25-CRRCT conveyor has tapered 2-1/2" diameter x 11 gauge rollers. Overall frame widths: 22-1/4", 24-1/4", 26-1/4", 28-1/4", 30-1/4", 34-1/4", 36-1/4", 40-1/4", 42-1/4", 46-1/4", 50-1/4", & 54-1/4".